"This is a great dish when you have all those extra summer vegetables on hand. Add some chicken if you like to make it a main dish, and serve over rice. The secret is to use all fresh vegetables." Place butter in a skillet over medium heat. 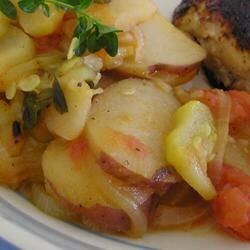 Stir in potatoes, squash, tomatoes, and onion. Season with salt and pepper. Cook, stirring occasionally, until tender, about 30 minutes. These are so simple and are so good, and gues what? Their healthy, i love them, their great with any meal and so easy to prepare. This is great. I guess the reason it doesn't get 5 stars is because it is almost too simple, ie all the goodness is in the freshness of the vegetables. This was great! Next time I will throw in some bell pepper to add a little color, but the taste is fantastic. Great new way to use summer veggies especially yellow squash.